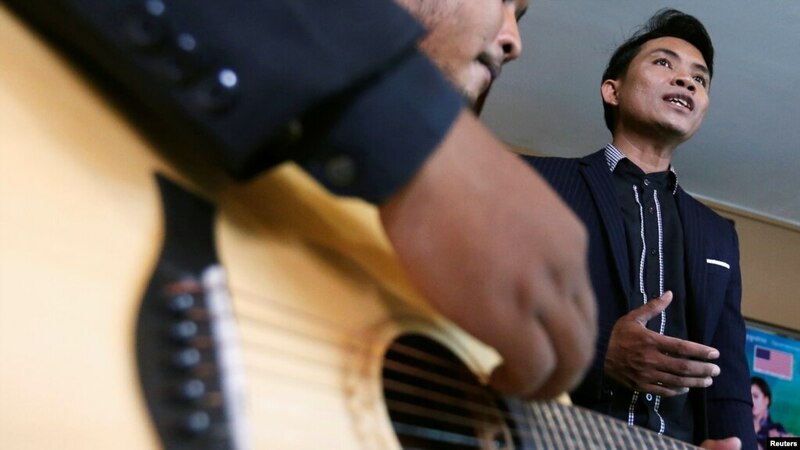 PHNOM PENH (Reuters) – With U.S.-Cambodian relations at a low and Chinese influence growing, Washington is trying a new way to win hearts and minds: sponsoring a well-known Cambodian musician to sing positive songs about America. “When there is tension, countries seek ways to ease it so arts and culture can help,” said 37-year-old Yorn Young, who launched his “Lovin’ USA” album in Phnom Penh on Tuesday. He was not worried if people thought it was propaganda, he added. Yorn Young told Reuters he was getting over $10,000 from the United States for a concert on March 17 in Kampong Thom province, north of the capital. More concerts could follow if it is a success. Diplomatic ties between the United States and Cambodia have worsened during a crackdown on opponents of authoritarian leader Hun Sen, who has ruled the Southeast Asian country for 33 years and made it one of China’s closest regional allies. The United States scaled back aid after the main opposition leader was arrested and his party banned ahead of an election in July. Planned aid for Cambodia has also been reduced as part of more general cuts under U.S. President Donald Trump. Meanwhile, the government accuses the United States of supporting opposition plots to win power. Yorn Young’s music could help improve the relationship, the U.S. embassy said. “I think it brings us closer together,” said Cultural Affairs Officer Monica Davis. Hun Sen often reminds Cambodians about devastating U.S. bombing that began in the late 1960s and a coup by a U.S.-backed general in 1970. Shortly afterwards, U.S. troops invaded from Vietnam and war engulfed the country, leading to the takeover by the genocidal Khmer Rouge in 1975. Public opinion toward the United States in generally favorable, however. A 2016 survey showed that 85 percent of Cambodians had a positive view of the U.S. impact on the region. “From America’s perspective, they have lost Cambodia to China. What they continue to possess is the goodwill of the Cambodian people,” said political commentator Ou Virak. The songs on the album “Lovin’ USA: Yorn Young Journey Across America” are about the beauty of U.S. cities and states that he visited in recent years on trips funded by the U.S. government. “Cannot believe it’s real. Smiling scenery so appealing,” are the Khmer lyrics of “Florida, Florida”, sung in a slow and sentimental style. The United States remained very important to Cambodians, Yorn Young said. “In Cambodia, people spend U.S. dollars, the internet is American, everything is American,” said Yorn Young, who has also performed at Cambodian government-sponsored concerts and said he had a good relationship with government officials. Sok Eysan, a spokesman for the ruling Cambodian People’s Party, welcomed the musical initiative as a positive sign – while also condemning the Trump administration’s “support of its puppet, the opposition party”. The United States has dismissed accusations of American backing for an alleged plot by opposition leader Kem Sokha, who faces treason charges he says were intended to stop him contesting the election. The White House said last week it was suspending or curtailing several Treasury, USAID and military assistance programs that support Cambodia’s military, taxation department and local authorities. Hun Sen has challenged the United States to cut off aid altogether and pointed to Cambodia’s growing help from China. According to official figures, Cambodia expects more than $260 million from China in bilateral aid in 2018 – more than seven times as much as from the United States. Most Chinese aid goes to big projects such as dams, roads and power grids rather than “soft power” initiatives.